Growing Readers & Writers using Predictable Charts! When I began teaching Kindergarten, my mentor, Ms. Wynn (the AP of my school) insisted that I use this one piece of curriculum: The Predictable Chart. After using it for just one week, I saw why. The repetition of the sentences encourages fluent reading and sight word recognition. It is also a quick mini-lesson that can take just 10 minutes/day! The Predictable Chart is simply written in front of the children, as you go, and on Chart Paper. 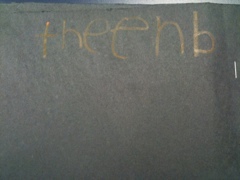 It is a great way to make sentences with the sight words that we are focusing on for the week. Later in the year, I type the sentences for the children to see on the Smartboard, and I have them type in their word to complete the sentence! This is an example of a completed”Predictable Chart” that I did with my class. 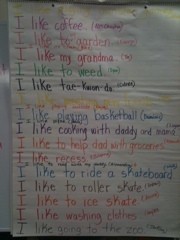 “I” and “like” were the sight words that we focused on in this chart. Day 1 – 3: To begin, the teacher writes the sentence and lists what he/she likes. As you can see, I wrote: “I like coffee.” Then, I wrote my name in parenthesis. Then, I let another student say their sentence, as I write down exactly what he says, emphasizing spaces between words, letter formation, capital and lowercase differences and correct ending marks. This would take almost 30 minutes to go through a class of 20 students, so I go through 5-7 students each day, taking only 3 days for everyone to have a turn. Day 4: Children (or I) cut apart the sentences and words, for each child and the children put their sentence back together again. I check it and if its correct, they can glue it to construction paper. Then they read the sentence. Day 5: I have them write their sentence all by themselves. 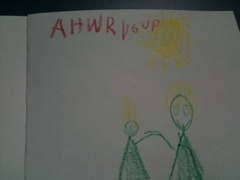 This is a great way to see if they have learned to read the words, as well as write them. 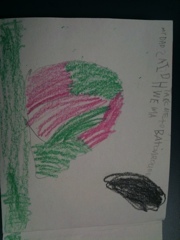 Then, each child illustrates their own sentence. When finished, they read their sentences to one another. This is one of the first Predictable Charts that we did at the start of the school year. 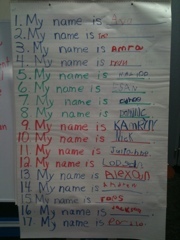 I made it interactive and had the children come up one by one and write their own first name. I usually do the Predictable Chart lesson at the end of my Phonics lesson. It is a good transition that goes right into my Literacy/Reading Lesson or Story of the day. I have made some labels to help me encourage my students to write more. Each attached sheet below can be printed out and then cut apart to give each child one label. 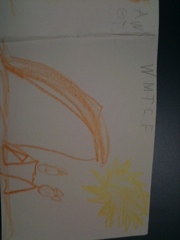 The label will help remind everyone what the child should have written or drawn about on that particular day. I have already found some great labels online that I have printed and added onto either notebooks or bradded folders. 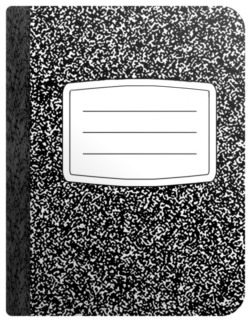 I used whatever I had received for school supplies (composition books for Reading and Writing, spirals for Science, bradded folder filled with hold punched construction paper for Poetry and the same for Math). These journals will be a great tool for tracking student progress and to also allow them to reflect on what they are learning about. This is the first year that I will be having my students use a journal for every subject area. What a great way to reduce the cost of copies and the use of those unappealing worksheets. Teachers, parents and children like to see what they can do on their own anyway! 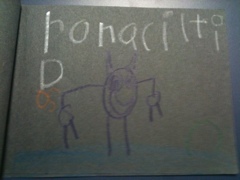 Amazing – five year old authors and illustrators! 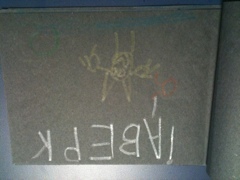 Have you ever seen a five year old, of average intelligence, write her own little book out of folded construction paper? 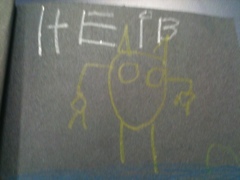 Last year was my first year teaching Kindergarten students how to be authors. 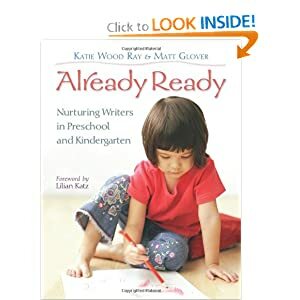 I was inspired by the book Already Ready by Katie Wood Ray and Matt Glover. 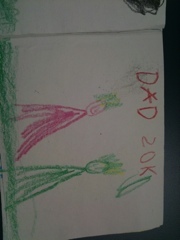 I was skeptical at first, until I saw my daughter start writing her own mini-books. She was also a Kindergarten student at the time. 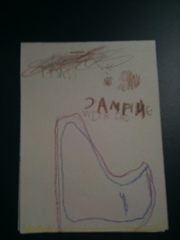 I now have a collection of her original works as a five year old author, from August to May. 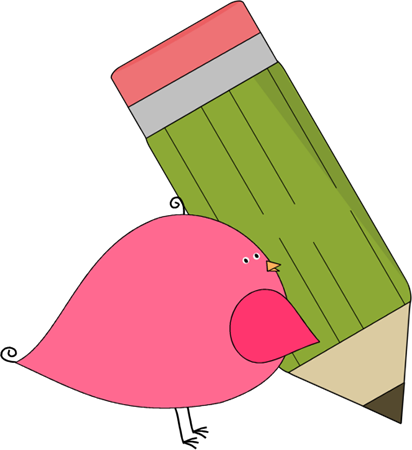 This year, I launched my Writer’s Workshop again. 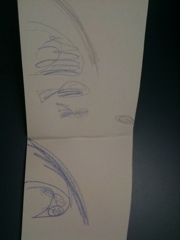 Here is how I began. 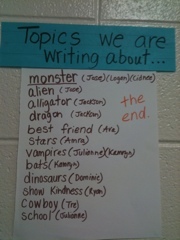 I asked my students to think about what they like and what they would like to write about. Amazingly, it took only seconds for them to think and tell their buddy what they wanted to write about. I heard these ideas from my students: “race-cars!” “lipstick,” and “puppies!” Finally, I gave each child a little tiny book and they began writing. I reminded them to write their title first and their name, since they were the authors. I must say, I was so amazed by their cute and simple illustrations. 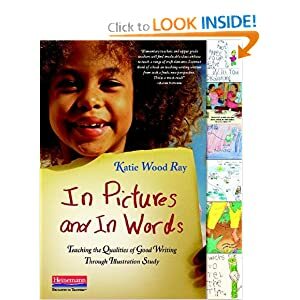 Most students wrote no words yet, but that is ok, as Katie Wood Ray asserts in her books. Illustrations can tell a story and this is how we encourage students to begin reading-to look at the pictures and tell what is happening. 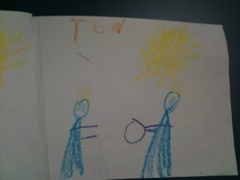 So, this is how we encourage writing, by beginning with illustrations. After about 5-7 minutes of writing, I told the students that we would have to stop for now and continue writing tomorrow, during our Writer’s Workshop. They begged for more time, but I showed them their brand new Writer’s Workshop folders (pocket folders) where they would put their little books. My student’s were so proud of their books. The next day, I had them begin on the rug with their books and “read” their books to a buddy. 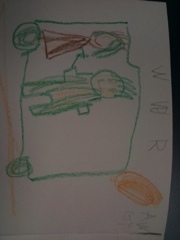 I paired up each student with a buddy, to make it less chaotic and to ensure that each child had someone to “read” to. After a minute of sharing, I instructed them to go back to their tables and write some more. 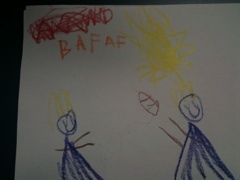 The use of color inspired my little ones. 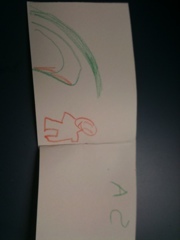 We noticed how the illustrator chose to use black paper for her book and how it made the book for colorful and spooky! So, we decided to write our own spooky books! 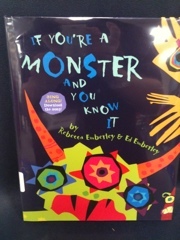 Many students wrote about monsters too! 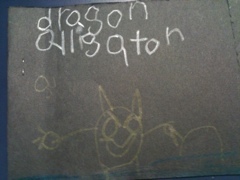 Title "Dragons, Alligators and Monsters"
Jackson wrote: "I see a monster"
"He has no mouth or nose"
Since it is the beginning of the year, Kindergarten students do not yet understand the cocept of "sounding out" words to write them. 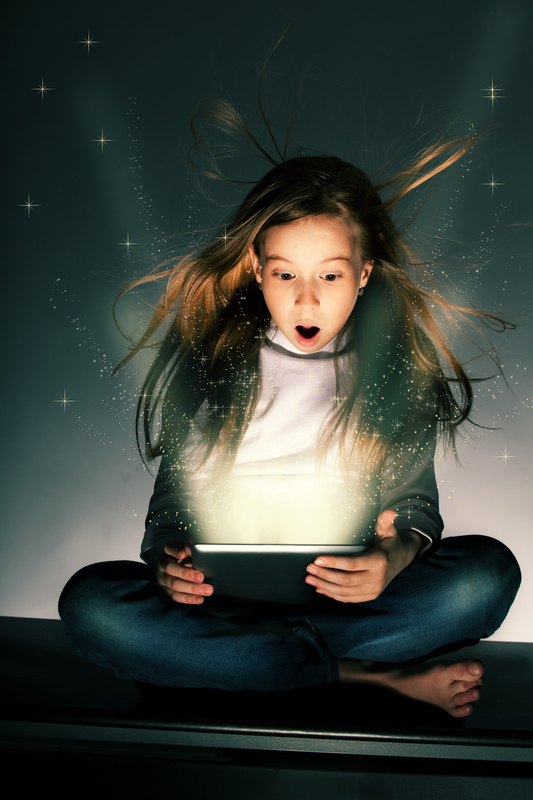 Many of them are at the phonetical or pre-phonetical stage of writing, which is actually developmentally appropriate. 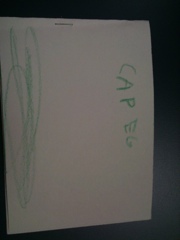 However, I help them to "sound out" titles for their books by making a running list. This is the list that we compiled before writing in the little black spooky books.